Helen’s upper body is affected by thalidomide but it’s never stopped her exercising. 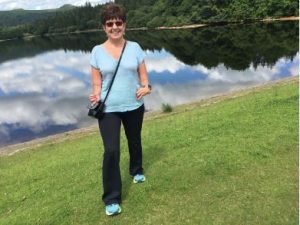 Like all of us, though, she slowed down as she was getting older – and now she’s found new ways to boost her fitness and wellbeing. “When your kids get older you end up running them around to places. You stop doing things for yourself and exercise tends to drop off. You get older and your joints deteriorate, you eat more and then you start to notice it. “On a visit to an NHS rheumatologist, nothing to do with my hysterectomy, he suggested that I tried hydrotherapy to increase my mobility. It was hard to get myself out of bed to go, get in my swimming gear and go to the pool – and when I got there we did 20 minutes of what felt like basic warm up exercises and then we were done. “Another turning point was three years ago when I embarked on The Daniel Plan with my church group. The plan covers five areas; Faith, Food, Focus, Fitness and Friends. “I really loved the Friends part of the plan – it encourages you to exercise with friends and we’ve been meeting up for walks ever since. There are some beautiful walks around Plymouth. We set ourselves a goal of doing the Neon Midnight Walk for the local hospice and met up to train from January until the Summer. The walk is 13.5 miles and we did it! “I went to the Trust’s ‘Fit for the Future’ event two years ago and got a lot out of it." "I knew a lot of the stuff already but also picked up lots of tips. 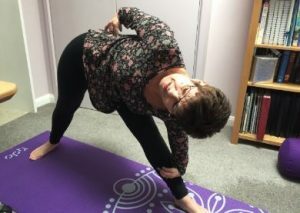 When I got myself out of bed at 7.30 am to do Sue’s stretch class I thought I was mad, especially as I had a really painful hip – but I came away with my hip totally pain free. That’s why exercise is so important. “When I went to the second Fit for the Future event I found Pilates a real help. I’ve just got the number of a lady who does one to one tuition and I’m going to get in touch. Paying attention to diet and exercise really makes a difference – but it can be hard to make a start. I’d advise anyone thinking of making some changes to make an appointment, with a trainer, or at a class. You’re less likely to back out if you think you’ll be letting people down. Once you start and begin to see the benefits you’ll find it easier to do it on your own.